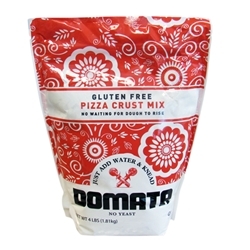 Domata Gluten Free Pizza Mix, created to eliminate the possibility of cross contamination with wheat flour. Making pizza crust is as simple as adding water to the Domata Pizza mix, at a ratio of approximately, two to one, two parts being flour, one part being water. If mix is too wet or sticky, add flour one TBS. at a time. Mix until the dough gathers on the paddle and the bowl is clean of any loose flour. DO NOT OVER-MIX. Domata pizza mix made with the original Domata Gluten Free Flour and blended complete with all necessary ingredients to make an outstanding GF pizza shell; feel free to add your own spices as desired to this mix. This recipe created without the use of yeast purposely in order to provide Gluten Free Pizza on demand. 2 cups of pizza mix and one cup of water makes one 12" pizza shell. 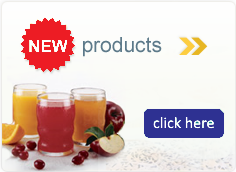 Ingredients: Rice Flour, Corn Starch, Tapioca Dextrim, Nonfat Dry Milk, Whole Egg, Sugar, Salt, Xanthan Gum, Baking Powder (Sodium Acid Pyrophosphate, Sodium Bicarbonate, Corn Starch made from non-genetically modified corn and Monocalcium Phosphate), Soybean Oil, Rice Extract.